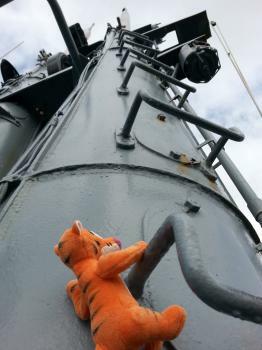 Bowfin and Submarine Museum (2 of 2): Pearl Harbor, Hawaii #PearlHarbor #Hawaii Tigger Travels - Family Adventure Journal Photos From Tigger`s Travels and MORE! The mess on the Bowfin. Bench seating on tracks. 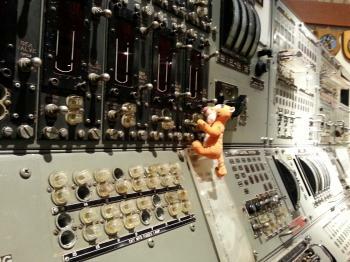 One of several control panels at the Submarine museum. There are a couple of locations that offer food. 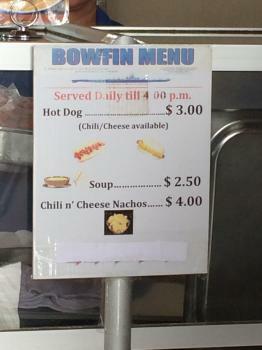 The food stand in front of the Submarine Museum offered a hot dog for $3 and Chilli and Cheese Nachos for $4. 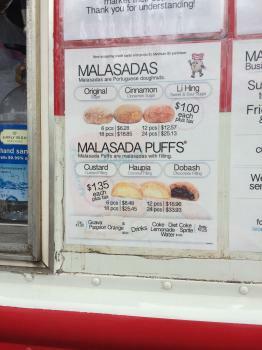 Malasadas for $1 each are available, too! All were good without feeling like being at a pro ball game concessions stand. Very suitable for a day spent here. 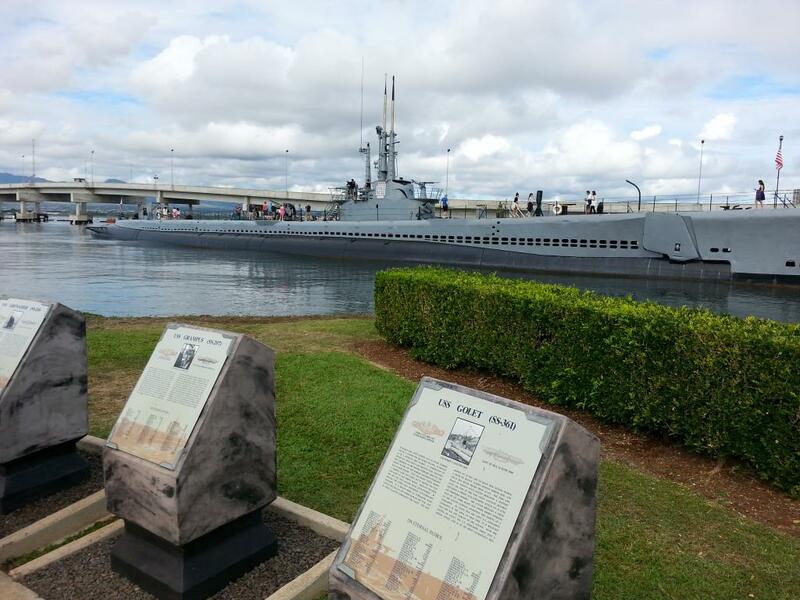 There is a small fee for admission to the Bowfin Submarine and the Submarine Museum. 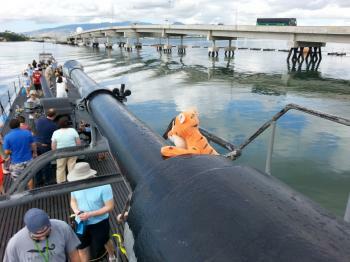 A walkthrough of the sub starts at one end and proceeds nearly the whole length of the vessel. Beginnning in the torpedo room that doubles up as sleeping quarters guest will quickly see that the spaces on submarines are even smaller than one would ever imagine! Had the bunks not been chained up against the walls in their storage position there would have been barely space fo a single crewman between the bunks. The doors through the bulk-heads deviding each section will make one feel like they are crawling though a children's playground structure meant for smaller children. 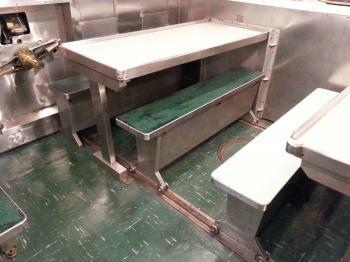 The Galley where food is prepared and the dining area would be used in shifts as it was not big enough to hold all crew members at once. Benches are on a clever track that allows them to be easily pushed out of the way for the area to serve in other capacities. 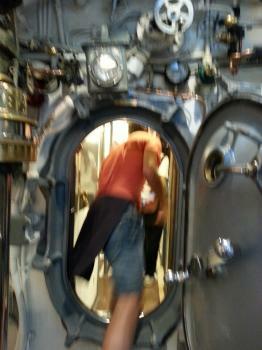 This part of the sub is adajcent to the officers quarters to the forward and more crew quarters to the aft. The control room is where the whole vessel can be commanded. If there are more levers, switches and valves than on any other piece of machinery made by man. The quanitity will leave anyone breathless. 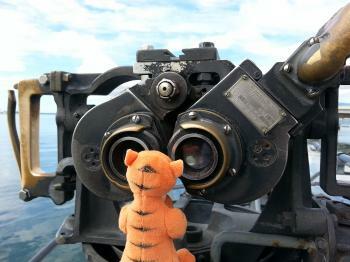 Even after bouncing around reading all the labels Tigger could not imagine what most of them do. Along the way there are partially obstructed views of the lower deck where much of the engine functions are located and up in the upper deck inside the tower. Communications is immediately behind the control room and eventually the engines closer to the aft (or rear) of the vessel.The twin General Electric engines seem five times larger than they could have possibly fit in this small area. As you walk back, don't miss the massive machine room, actually smaller than most children's closets! All in all, the whole visit is very fascinating! 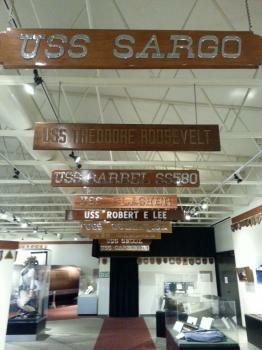 Surprisingly large, the Submarine Museum houses a wide array of exhibits from the Bowfin and many other submarines. There is even a Poseidon C-3 ballistic missile designed to be launched from a larger sub but resembles something that could be send into space. The museum houses control panels, models of vessels including a better view of the Bowfin's insides. Parking is convenient, get there early for best experiences. Tigger spent just over four hours there and felt there was still a little more he could have absorbed. The day included a boat ride and tons of amazing history during one of the most turbulent periods of world history. A good picnic lunch around 11:00 really topped off the day and made it absolutely perfect!